If you are having trouble viewing this ezine, click here. On a personal note...February is the month in which we celebrate Valentine’s Day. Consider something new this year and be your own best Valentine! I am so pleased to have your subscription to A-Muse Letter! I hope you are enjoying receiving it. As you know, each month I offer coaching tips, ideas and inspiration to support you in your writing, creativity and personal growth. Please send your comments and questions and I'll write back personally or respond in a future edition of A-Muse Letter. For therapists who want to integrate journaling into client work or anyone interested in using journaling as a tool for personal growth and transformation, this pragmatic step-by-step guide will provide an invaluable resource. "Writing is a powerful method to help people get through difficult times. This is the first book that focuses on ways therapists can help their clients harness this powerful method. Check out Susan Borkin's book, The Healing Power of Writing." "An excellent tool for therapists and their clients. 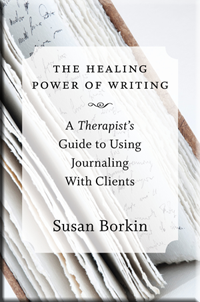 Susan Borkin explains precisely how journaling can aid the therapeutic process and offers up practical exercises for addressing a wide variety of problems. Highly recommended." "Psychotherapist Susan Borkin reveals how writing-simple, honest, moving, and direct, while also private and unedited-may be one of our best medicines, allowing us to meet self and other in deeper ways, resolve conflicts, ease stress and depression, and much more. From a solid research base to practical hints, stories, and examples, this book will change the lives of both clients and therapists." "Borkin masterfully presents us with the gift of her accumulated clinical discoveries about writing for psychological well-being. She takes us on a kaleidoscopic tour of the practicalities and possibilities of writing to deeply enrich, understand, and change our lives. Although written primarily for clinicians, both therapists and non-therapists alike will discover a feast of original and useful expressive writing ideas." This award-winning journal software is now online. Great for journal writers on the go with your Mac, PC you can access your journal on the Internet. LifeJournal has the highest encryption security and is password protected to keep your journal totally private. LifeJournal Online has interactive tools to expand your journaling in ways that you'll love. I have personally used LifeJournal Online and absolutely love it! It is easy to use and keeps journal entries organized and accessible. You can even test drive it for free. Check it out here. On occasion I will recommend products and services from colleagues for which I receive a small affiliate stipend. Rest assured, I will never suggest anything I do not completely believe will be of benefit to you. De Anza College, Cupertino, California - 9:30 - 4:30 pm- Full-day workshop – only $79! Are you feeling stuck, out-of-focus or confused in your life direction? Do you think there is something more for you but don't know what it is or how to find it? Have you lost track of what's important to you? In this highly experiential writing course, you will learn over ten ways to use journaling to profoundly impact your life and create the life of your dreams. Although simple in methodology, journaling is a rich and powerful resource for contemplation, discovery and change. Be prepared for an experience that will transform, challenge and delight you! For registration information, please click here! Remember, if you haven't done so before, take advantage of our Complimentary Coaching Consultation. Contact me for an informative discovery session via phone or in person. Phone (800) 552-WRITE, that's (800) 552-9748 or write to me at susan@susanborkin.com to find out more. Need some journaling tips? Send for your GRATIS BONUS ARTICLE "JUMPSTART YOUR JOURNALING" Send an e-mail to susan@susanborkin.com, requesting the article by name. Have a question about writing or creativity? E-mail your question to Susan. She may use your questions in future issues of "WRITE NOW! A-Muse Letter by Susan Borkin." If you have picked up a newspaper or listened to a newscast within the last month, you have certainly heard enough about winter storms! 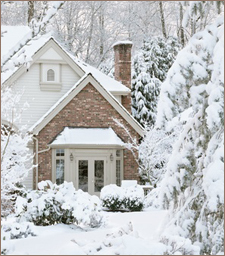 Why not take advantage of the cold, snow or rain outside and curl up with your journal inside? Here is a great technique for doing some in-depth winter writing. Winter can make you feel like hibernating. Take advantage of the season and go deeply into an area you have been ignoring or avoiding. Perhaps it is a relationship you have been struggling with, a decision you are having trouble with or a project you have been procrastinating. Whatever the issue, commit to writing about it for seven days in a row. That’s right. Take a week and in as little as ten minutes a day (of course you can write more if you want to! ), write about this subject. Go ahead and complain, whine and dump. Get it out of your system. Continue writing for seven days, even if it feels like you aren’t going anyway. Continue to get it all out. Susan Borkin, M.A. is a licensed psychotherapist, coach and writer. She is the founder of Write Now! a professional practice specializing in the use of writing for personal and professional growth. Susan specializes in helping people overcome creative blocks and achieve deep personal transformation through the use of writing. A journaling consultant and trainer since 1978, she is the author of When Writing From the Inside Out, When Your Heart Speaks, Take Good Notes, and The Healing Power of Writing (W. W. Norton). You are receiving this e-zine either because you signed up for it via one of my books, websites, classes or presentations or have otherwise indicated your interest. Please, if you would prefer not to receive it or I have sent this to you in error, let me know. Subscribe - Sign up on our Website at www.susanborkin.com to receive your own copy of this monthly ezine. You may always click on the CHANGE link at the end of this ezine to update your email address or otherwise change your account. Unsubscribe - If you wish to cancel your subscription, please click on the CANCEL link at the bottom of this ezine. No portion of this publication may be reprinted without the express written consent from Susan Borkin.